Knowing your credit card balance is important, particularly if you’re about to make a large purchase. You may also want to see how much damage was done after your last shopping trip or confirm that your most recent payment was posted to your account. Thankfully, you don’t have to wait until your next credit card statement arrives to find out your current credit card balance. You can easily check your balance via phone, internet, or smartphone app. Call the number on the back of your credit card to reach your card issuer’s customer service line. Enter your card number using your phone’s keypad and any other identifying numbers (like the last four digits of your social security number or your billing zip code) and follow the prompts to hear your credit card balance. Many customer service lines can give you the balance automatically without requiring you to speak to a representative. Any questions you have about your account or recent transactions will have to go to a live person. If you have set up an online account for your credit card, your process is simple. Just open up a web browser, type in the URL for your card issuer’s website, and log on to your account to check your balance. If you haven't already set up an online account, you can create a new account once you’re on the card issuer’s website. Check the back of your credit card or a recent billing statement to get the correct web address for your credit card issuer. If you need some assistance, your card issuer’s customer service department can help you set up your online account. When you’re creating the account for the first time, be sure you choose a username you can remember and a password that’s secure and can’t be easily guessed. Once you’ve logged on, not only can you see your current balance, you can also view recent transactions and other account information. If you have a smartphone, you have the ability to do most of your banking and credit card monitoring right on your phone. Most major credit card issuers have smartphone and tablet apps that you can download to easily check your credit card balance and other credit card details. Visit the Apple App Store or Google Play store to download your card issuer’s app. When you download and open the app, you’ll log in using the same username and password that you’d use on the website. 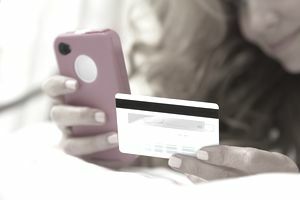 Your smartphone or tablet has to be connected to the internet in order for you to access your credit card information via the smartphone app. Never check your credit card balance over public wifi. This is important whether you’re visiting the website from a laptop or checking via a smartphone app, or even your phone’s web browser. Public wifi networks are unsecured and can be used by fraudsters to see the information you are using to access your credit card account.